A fine day to explore! Thought I, and headed to the ST stand on a Sunday morning. The day was bright, sky open and faintly blue. No cloud was in the sight, and the effect of the Sun was already setting in. The air was humid, scarce and smelled of fresh vada paav and chai. It was a busy morning, as usual, with beggars going about their business, students going to tuitions, travelers unloading, workmen rushing, trekkers grouping and drunkards blissfully sleeping. The scene at the city street was as normal as expected, which relieved me. I hoped for some early morning rains but the sky was devoid of it. I sighed and waited for a friend – and we boarded the Virar bound ST. We were heading Nagla Block. When I think of Nagla Block, I think the word “different” expresses it well. For it is indeed differently beautiful compared to SGNP or Yeoor. Comparing Nagla to the latter places is righteously possible since Nagla is indeed a part of SGNP. Lying north of Vasai Creek, it is thus isolated from the mainland SGNP. It is a place so dense that one can easily get lost in its sheer beauty and what it has to offer. Nagla is a place to be visited during any season, if you can bear the heat and least I forget, mosquitoes. It is more like Karnala Bird Sanctuary, and the forestlands near shorelines. It harbors a high density of butterflies and birds, famed leopards and other lesser fauna. Nagla is special because of its location, its habitat and its flora. I found Teak to be as abundant here as anywhere in SGNP, although other trees which I could only wonder of were beautifully gracing the sunlight with open arms and at their feet were lined masses of shrubs and herbs and whatnot. Nagla has an aroma that is different, a scene that is different and the feel to it. It’s undoubtedly different! Done saying that, I was glad to be back, exploring this familiar place at-the-back-of-mind after a long time. There is a tiny village at the base of the Nagla Range, typically made of dung and mud and everyday paving its way into the forest ahead. The guard house is always open, and someone or the other is always at the door to greet familiar faces. Armored with equipments to keep mosquitoes and horseflies at bay, not-to-forget rains, I awaited reaching there, which takes about 30 min from Thane. The weather cheated at the last minute. And we were standing in a heavy downpour, cursing the very wish of mine but that’s wildlife! I was sure then that the sightings will be even better when it stops. After a while it opened, the light sunned the leaves and all the sun-loving creatures came out of hiding. The trail lasted for several hours, trying to capture all the animals I could, I also cherished the place dearly. I was surprised to find no plastic littering when we wandered away from the village. That was the best part! One must expect the unexpected here and you will see bizarre and beautiful things all around you. 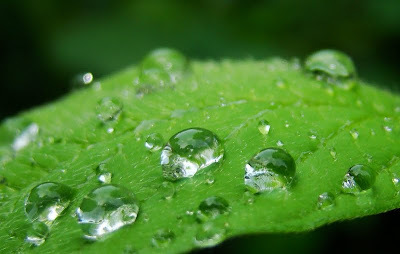 Unfortunately, the rain has been scanty over a period of several weeks. This has hampered the seasonal-cycle of many. Wherever I expected water, that stream lied dried and devoid – except some stagnant ponds harboring the remaining aquatic life. Is it us or El Nino? I gravely ponder. Commelina - A beautiful shrub of Commelinaceae family. Common during passing of Monsoon. Cyanotis - Another member of Commelinaceae family. 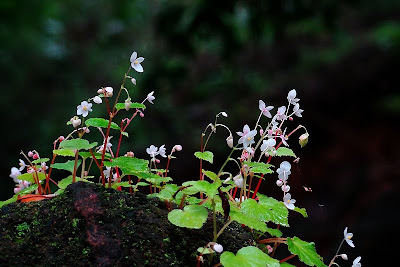 Begonia - Common Begonia growing wildl on boulders in a dry streambed. It was a beautiful view! Shown beloe is the full-shot of an individual Begonia plant. Above image shows a colony of Common Begonia flowering plants. A treat to watch during Monsoon months. 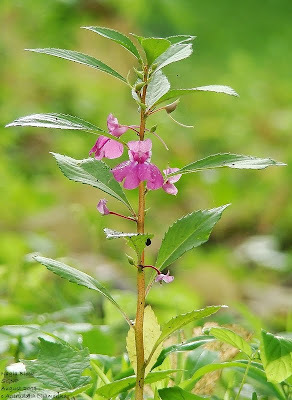 Impatiens minor - A common abundant shrub, often covering open patches and neath thick canopies. Seen on every trail during monsoon. 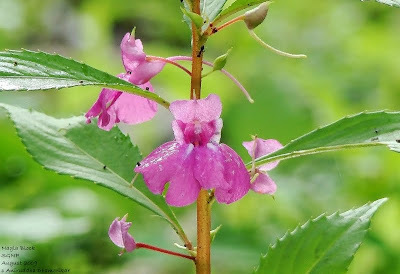 Impatiens balsamina - Another yet common and striking flower of Monsoon. Given below is a full length image of the entire plant. It is easy to identify by only looking at flowers, but the leaf patterns on many are equally important. Tree Gum - This excessive tree gum was oozing out of an open wound. It had several insects trapped in it. 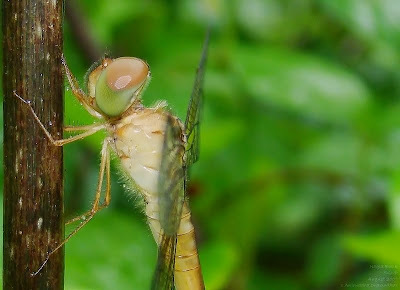 Unidentified Dragonfly - This dragonfly is probably Neurothemis intermedia. 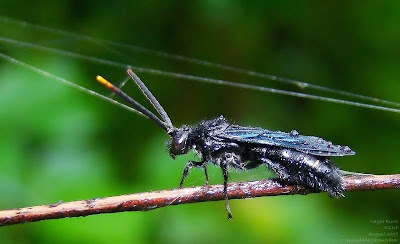 The above image is that of a beautiful wasp (most likely in the Scoliidae family) so common around that you might get tired of seeing it! But what's frustrating is clicking it, for it is hardly ever seen in one place. However one best place to find this one is while feeding on flowers like Leea. I was only lucky to see it drenched in the rains and taking a break. Who hides there? I asked, and tried to get a better view of the above grasshopper. But he was so shy that he did not heed me. Finally I managed this photograph. Above image shows a grasshopper and a pink aura of Wild Turmeric around it. Fresh monsoon feel. Katydid - Enough is said about this creature on previous posts. Here it probably was feeding on Commelina, and my presence was not entertained, so it was about to jump away. But I remained brief, and managed this shot. Spittle Bug Adult - Remember seeing some frothy spit-like thing on plants? 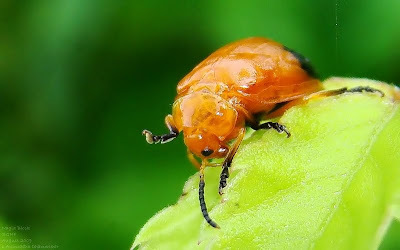 It is done by the larva of the above (and below) bug. They were very abundant. A beetle cleaning or rather wiping itself after morning showers. 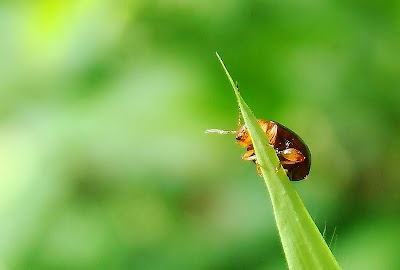 Another beetle played hide-and-seek with me! A caterpillar doing about its morning exercises? No. A caterpillar stuck in spider web? No. It's a caterpillar holding onto it's own silk as rain pushed her down! Now this is hard to believe, but it is a caterpillar. It is called a Looper caterpillar, that of a moth. The far extended side is the head, while it's hind appendages cling to the green stem. A Bird-dropping moth, yet unidentified. Unidentified Skipper. Belongong to Hesperidae, they are kind of moth-like butterflies. Some say they are the pioneers of today's real butterflies. But it's an entire unique family of thise small supersonic butteflies really. Monkey Puzzle - One of my favourite butterflies! Wonder why such a name? Well, look at it's wings and you will see the puzzle game commonly called monkeypuzzle! A Crab Spider stations itself on Balsam leaf. Lastly, a fresh raindrop. A life-giver. The Monkey's Puzzle Lycaenid is gorgeous! Wish we had something like that down here in SE Asia.